Dinar Trading of Lamaha Street yesterday threw their support behind the Guyana Football Federation (GFF) and Kashif and Shanghai organised inaugural ExxonMobil-sponsored International Futsal Festival. The tournament will be played December 27-30 and is expected to be staged at the Cliff Anderson Sports Hall pending approval. Iqbal Hussain, Managing Director of Dinar Trading, expressed full confidence in the organising ability of the K&S duo (Aubrey ‘Shanghai’ Major and Kashif Muhammad) and said he felt obligated to support them. He informed that the company had supported the organisation in the past and even though business is not as bright as it should be, the company must lend whatever assistance it can. Hussain said it felt right to support the efforts of the K&S and the GFF as they seek to provide meaningful avenues for young men to channel their energies and the level of experience and ability that come to the sport at this time with the inclusion of K&S is noteworthy. GFF President Wayne Forde (2nd right) receives the sponsorship from Clifton Singh in the presence of (from left) Aubrey ‘Shanghai’ Major, Vishal Rampersaud and Duncan Fraser. Meanwhile, GFF President Wayne Forde was on hand to receive the sponsorship and expressed pleasure at the gesture of Dinar Trading and noted that he will pursue a meaningful partnership with the company for the good of the world’s most popular game. Forde noted that he was very encouraged by the willingness of Dinar Trading to assist and give back to youths in this time when we celebrate the festive season, giving them an opportunity to display their skills. The GFF boss was upbeat about the upcoming event and the involvement of the Kashif and Shanghai organisation and the hope of similar partnerships with all stake holders to successfully grow the sport of football. 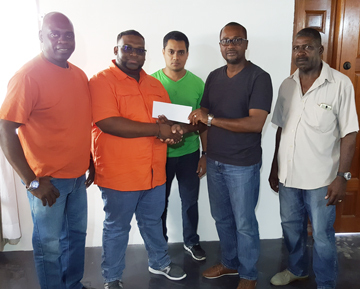 Employees of Dinar Trading including Vishal Rampersaud, Clifton Singh and Duncan Fraser assisted in presenting the cheque to Wayne Forde in the presence of Aubrey ‘Shanghai’ Major. Apart from main sponsor Exxon Mobil, Mohamed’s Enterprise is also on board with the event, it was disclosed. The tournament is expected to see the involvement of overseas teams Morvant Caledonia United of Trinidad and Tobago, a Soa Paulo selection from Brazil and ZV All-Stars of Suriname; while the local teams include East Coast All-Stars, Linden All-Stars, Georgetown All-Stars and West Demerara All-Stars. The winning team will pocket $1.2 million, while the losing finalist will receive half that amount. Third and fourth place finishers will pocket $300,000 and $100,000 respectively.